I'm currently working on optimising the lighting engine. I've already got a solution, I just need to apply it. Putting off items a bit because it's such a huge milestone, but it will happen. I just played the combat demo you put up. This is looking pretty promising. You've got a good feel for making things feel nice and visceral. I'm looking forward to seeing a complete game that's the product of your attention to detail. How did you do the blood splash that happens when an enemy dies? I quite like that one (the effects and animation in general are quite minimal and nice). I basically have a bitmap that is tracking the view port that I clean each frame with fillRect and then render all the particles to. This method allows upto 800 particles before the chug sets in. The particles then use verlet integration to fly about and raycast for collision with the walls. When the particles hit a wall and resolve, the multiRender function is called. Because maps will be bigger than the maximum bitmap size in flash (2880 x 2800 pixels), I use createMultiRenderArray to make a massive bitmap out of smaller bitmaps tiled together. So I have a big transparent bitmap that sits over the entire level that I can paint anything onto. And that's what I paint the blood on to when it comes to a rest. Allowing me to destroy the particle and recover cpu usage. I could effectively allow the player to tag walls if I wanted to, with no loss of performance. Great! Kicking a few heads around is always fun. I like where this game is going. Looking cool! 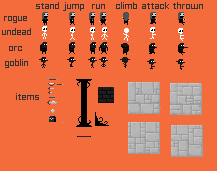 - only suggestion for combat so far would be that it would be nice to have multiple weapon types or swords etc. Not sure if that is in the plans. There's 5 melee weapons at the moment, the only difference being the damage they do, and the bow. The bow is obviously crap for damage, but with magic added to it it's very powerful. A lot of the flavour is going to come from the runes. So you can get different brands of weapon by tooling them up with different runes. I'll need to figure out a hot key system so you can swap active weapons. hey, demos looking great..don't know if somebody mentioned it already but I will now: Why's sometimes walking around is kind of bulky?She(?) stops and just shaking her hands but don't move like she should..hope you know what i mean ?! besides that :Good job ! second 37 shows it quite good that the character is moving not normal,not responding to the conrtols and walking against the wall. Hello, I'm just stopping by to wish you well. I'm really looking forward to your next release. Cheers! That's the first demo. The demo before I made MASSIVE changes to the game engine. The demos are there to show progress, if I spent all my time maintaining every snapshot of progress so that it worked perfectly, I would never get the game finished. Can you reproduce this on the latest demo? I can't reproduce it myself at all. I did find that if you hold down up it cancels the animation cycle when walking. So I'm still grateful for the bug report. That particular issue is fixed for the next build. Currently doing the UI for items at the moment and possibly the whole in game menu. It'll be a week or more before I can show progress. Cheers for the support. i see..just to let you know:in demo2 she's doin the same:shaking,not responding accordingly...anyway the concept is great and the light is cool ! Mind telling me what version of flash player you have installed? It's compiled for Flash 10. I also need to know the exact behaviour that causes the bug. We have a rule at work, "can't reproduce the bug, can't fix the bug". I've never experienced the behaviour you've explained, but I may be playing the game in a particular way. The issue may also be due to the Flash Player on Linux. just walk in one direction for a while holding down any arrowkey(holding,not pressing). she starts to do half steps,like starting one step and start again with another step not finishing prior. I'm not getting that behaviour at all. Must be a Linux thing. You getting it with W,A,S,D too? Is anyone else getting this behaviour? A mate of mine has always been coming out wearing different hats these days. A girl looks good in a hat, so I've been inspired to add them to the game. Especially seeing as I really enjoyed donning a cool India Jones style hat in Torchlight. So, because I was thinking how much a shame it is that I can't really do different armour sets on characters, instead of armour, there will be hats! So far I've got a sombrero, top hat, trilby, fedora and baseball cap. I need a sixth hat really (tried bowler - doesn't really work at such a low rez) and I'm not sure what order to set the hats in terms of the protection they offer. Maybe a little red hat with a feather in it would be nice. Also, how about axing the baseball cap and add a little conical wizard / party hat? I am eagerly awaiting future releases of this game.